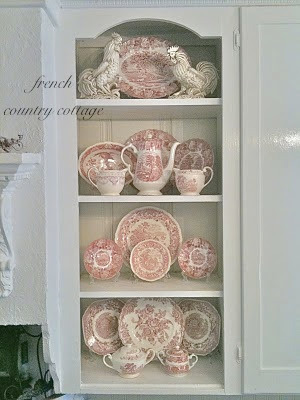 A french country kitchen just doesn't seem complete without a couple open shelf display areas. Whether it's simply shelving to hold dishes, a vintage cupboard or open areas built in. that was overshadowing the charm and character that our vintage kitchen had. which meant we had that character to work with. that would be mounted to the wall. I promised to share some of what we did to renovate the kitchen. and so am starting with the open display cupboards. so just a fresh coat of paint was all that was needed to perk them up. and so we were debating milling new doors for the kitchen. But once I removed the door, I was in love with the open shelf area. I knew that painted a creamy white- it would beautiful. I just removed the end door on the other side as well for symmetry. Once the doors were off- the insides needed to be finished up. and added simple 1x2 trim to finish off the inside area. and then painted everything inside a creamy white. something at the top to finish them off. So I decided they needed an arch. case you are ever in need of a quick fix. that was a bit more involved- but fairly simple and it is such a charming feature. only on this post would we combine french country and get 'er done! ha! LOVE your kitchen. Totally love it. Love the shelves filled with all the different goodies... your roses and the double chandeliers. It is always a treat to peek at this space!! I too like open shelving, however I prefer my open shelving with open wire/iron pattern doors covering the front so that everything can still be seen. I can't say it enough. I LOVE your space! I think I'm in love with your kitchen! Great job - it looks absolutely delightful! So classy and beautiful Courtney. I love every single detail of your kitchen! Can I just move in? I'm in love with your kitchen! The open shelves look lovely and your displays and styling are simply beautiful! Love, love, LOVE!! I adore your open shelves and the pic of your island with all the goodies on it is beautiful. Love, love, LOVE, Courtney! Everything looks great! When I redid my kitchen I removed and trimmed out some of the doors also. I love my farmhouse style open shelving. I know many are concerned with dust, however I have not found that to be a problem...I use those dishes on a daily basis and no dust builds up. Your open cabinets turned out lovely and so stylish. It looks sensational! I envy your skills too! I love your open shelves, Courtney! They are just the right size, too. I also like the great way they break up those cabinets with doors. I think it is visually more pleasing. Well...you know how much "I" love the open shelving and the arches...lol Since I so totally copied you in my kitchen. I get so many complements on the addition of the arches and I think it really makes the cabinets look finished. I just swoon every time I see your kitchen Courtney. Just fabulous!! Your kitchen is absolutly stunning. I love the open display.Thanks for sharing. Courtney I love everything about your beautiful kitchen!! I love your kitchen too! You can totally change the feel of the room by rearranging your display of dishes. I would be spending a lot of time in this room. Your little arches make those cabinets look like they were custom built that way. Genius! Lovely, just so lovely! I would be happy to be in this room! Love the open shelves... I think it adds character and interest to a kitchen. Yours look beautiful Courtney. I love your kitchen, and your arched shelf piece is perfection! Magnificent kitchen....I especially love the red transferware in the cabinet...Such a wonderful color scheme for the kitchen...Everything is just gorgeous! What a transformation! Your kitchen is absolutely stunning! I love your kitchen! So beautiful! The shelves are wonderful. Your whole kitchen is lovely and I know you are going to enjoy being there. Happy days ahead! Oh, first thank you so much for changing the comment options, so I can leave you comments on how inspiring you are... I love the idea of open shelving, and I read every details on all your posts on your kitchen. I was supposed to redo my kitchen this summer, but due to problems that happen in a very old house (! ), it's delayed until summer 2013. I could cry of frustration, but it's also a good thing as I get more time to "think" my kitchen... Starting from scratch, as I only have a sink in the room, I love seeing beautiful kitchens like yours. Just love your kitchen and the red transfer ware as well. I love the quality of your shots too, well done. Thanks for sharing. I love what you have created in your kitchen. I just adore the unit that you have in the centre and it has given me a great idea for our own kitchen. I am a new follower and will read your blog with relish. Boy do I have "kitchen envy", the look you've achieved is exactly what I'm looking for in my kitchen. Thanks so much for the inspiration. Such a beautiful transformation you have done with your kitchen, I just love it. Your open shelves are lovely, and the addition of the trim was an inspired idea! You have great taste, and your love for your home........shows. Hello Courtney, the end result is quite lovely! I wish our cabinets were original - our kitchen was actually 2 rooms - a butler's pantry and a very small kitchen. I am glad it is opened up now - the cabinets added in later were not very pretty. I painted them and have been toying with the idea of putting glass in some of the door centers. Now, I think I'll take everything out of the cabinets - review what was stored and see if there could be any shelf left open to display. Inspiring! The kitchen cabinets are beautiful. You have a wonderful eye for detail!!!!! Love Love Love your kitchen and what you did with the open shelves. Beautiful and love the red transferware - do you mind sharing the pattern that you have? Your kitchen is fabulous. I really enjoyed this amazing post. I would love it if you would share this post at our WIW linky party? Hope to see you there! Your kitchen is one of my favorite all time kitchens. You were so clever to remove the doors and put up the beadboard and then paint it all white, and the little arch just made it all, so simple and such a huge difference it made. Your style and talent are just amazing, and you're pretty much my 'decorating a home' hero! Oh, Courtney, I LOVE your kitchen. Everything from the beadboard ceiling, to the open arched cabinets, to the double chandies, to the work island ~ I L.O.V.E. it!!!! Wow Courtney, what a gorgeous kitchen! I love the white cupboards and chandeliers. Opening the cupboards up created such a darling space to display your collectibles. I love your red transferware. It is something I don't have, but would love to collect. Your idea of drawing the arch sounds like my kind of technical way of doing things. I've found plates make great patterns for a lot of things. lol! Thanks so much for sharing this wonderful space with Share Your Cup! I'm still trying to sell my this idea to my husband and your beautiful kitchen just might be the answer! Thanks for sharing! Absolutely gorgeous. I will be featuring this at my Swing into Spring party that opens at 8pm EST tonight. Please stop by and pick up an I've been Featured button. Thanks. Courtney, Your kitchen is so beautiful and I love the open shelving! Thanks for joining the OHP. AMAZING!!!!!! I want you kitchen! Hi Courtney, just wanted to let you know that I am featuring your open cupboards for Share Your Cup today. You always amaze me! Lovely!! I am hoping to work on my kitchen and will use yours as inspiration! I am also your newest follower! Your kitchen is stunning...what a great renovation! Everything about it is just right...! It's so gorgeous Courtney! I love the arch in the open shelving. Great idea! Great job! Love your kitchen, the island was a great find. Everything You do is the BEST! I'm a little in awe of anyone who can do the open shelving thing. I think it's as lovely as can be, but in my house people would have everything splattered with God-knows-what all the time. Not charming, I assure you. I am in love with your island. Did you do it yourself as well? I'm about to research your blog and see if I can find out. I would love a simliar island - only larger. Fantastic! I can hardly wait to play "copy cat" to some of your ideas! Wish I had this kitchen! Beautiful kitchen! Please tell me about the chandelier how much wattage can it hold? How you did it and where you found the 2 that goes into one stem? Not sure how else to put it?